Town of Mt. 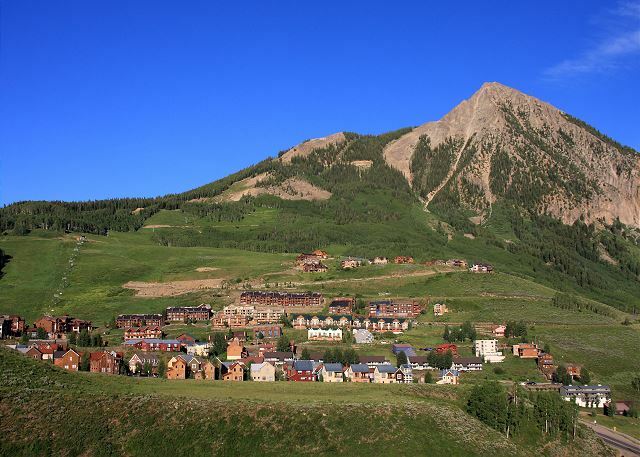 Crested Butte, Business License No. 19-636. This cozy two bedroom unit was just given a tasteful remodel, including refinished kitchen cabinets and counter tops, new appliances, new beds and linens, and colorful and comfortable new living and dining room furnishings and decor. The fireplace is actually a wood burning stove to keep you toasty after skiing! The condo has 2 large bedrooms, each with an adjoining full bathroom.Enjoy the views year round from the large patio accessible from the living room and bedrooms. For an added convenience feature, International 102 is located close to the hot tub, sauna, and laundry facilities. Enjoy easy access to and from the slopes and trails winter and summer from I-102! The International Building is entered on the 3rd floor. Walk down two flights and you reach I102 on the ground floor. Complex amenities are sure to complete your experience. As on-site office and staff makes it easy to check-in/out and answer any questions that arise during your stay. Housekeeping services are provided to all stays that are 4 or more nights. In the winter, San Moritz has its own private shuttle service that is free with your stay. The shuttle runs daily during the ski season from 8 AM until midnight. They’ll even pick up and drop off right outside your condo! During the winter, you can also enjoy a soak in the indoor hot tub. The sauna is open year round. For added convenience, every building has 2 washers and dryers for guest use. Everything you need for a comfortable stay! A very nice and perfect condo for the skiing experience. Clean and up to date, although I spent a good amount of time trying to clean the stainless steel pots and pans every time I used them. A non-stick set of pots and pans would be a great addition! And one last comment - if someone is sleeping in the top bunk bed, it squeaks EVERY time the person turns over. Otherwise, a great spot! Great place to stay with great views! Didn't have any issues with the Condo. Comfortable place to stay. Beds were very comfortable also. Has a great porch with plenty of seating to enjoy the beautiful views after a day of hiking. Very family friendly. I would definitely book this place again.